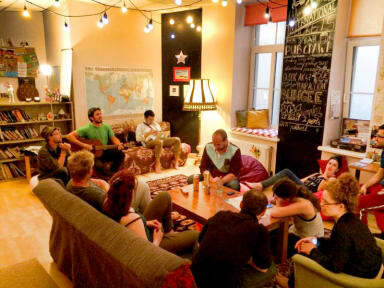 A really perfect Hostel with so many nice people and a great location! Great hostel for solo travelers. Cozy atmosphere, super clean and perfect location. Totally recommended to stay there. You think about visiting Riga? Than you should choose this hostel. It is situated only an few minutes walk from the old town. What I liked most in the hostel was the atmosphere. Every evening nearly everyone(at least those who want to talk to people) meet in the living room. So you have the chance to talk to a lot of different people from all over the world. And don't forget the waffles in the morning! They are really delicious! I had a wonderful stay at Cinnamon Sally's - both staff and other guests were friendly and welcoming. Entering the hostel, you basically stand in the common area which makes is easy to meet everyone. Staying in a 6-bed-all-girls-dorm was very pleasant, the bed was incredibly comfortable and the room was spacious. All facilities were clean at all times and they even do waffles for breakfast everyday! They offer events daily (board games, shared meals, pub quiz etc) but it's all very relaxed. Amazing hostel! I stayed here for 3 nights and wish I could have stayed longer. Small, cozy, with a kitchen in the lovely decorated common room which makes it really easy to meet people. Super nice staff. They offer free waffles for breakfast and there is a social event every evening. Towels are free. Several power outlets at every bed. Everything was clean. And the central station and a big mall with restaurants and a supermarket are just 2-3 mins away. I highly recommend Cinnamon Sally! I had a great time at Cinnamon Sallys. It was a really nice and comfortable atmosphere, the staff was nice and the rooms good. Next time in Riga, I will definitely stay there again!